The very instant you drive a brand-new car off the lot, you have just lost thousands of dollars. The immediate depreciation of value is, hands down, the worst part of buying a new car. According to data collected by Edmunds.com, new cars lose an average of 11-percent of their value right when leaving the dealership. After the initial hit, new cars will realize a reduction in value at a steady rate of 15- to 25-percent each year and after just five years, most cars will be worth under 40-percent of what they cost new. While this fact of new car purchases is hard to swallow, it’s actually great news for buyers of pre-owned vehicles. Five years ago, Subaru offered the 2010 Impreza WRX STI Special Edition for right around $33,000. With the Subaru exchanging hands from the original owner to the next, used 2010 STI models can be bought for approximately $20,000, leaving plenty of funds for performance upgrades. The biggest hurdle for anyone looking to buy a used STI however, is finding a clean and unmodified car. This is especially difficult since many racing enthusiasts gravitated toward the high-performance model of Subaru’s Impreza WRX offering. For this Quick Tech, we ran a series of tests on a pre-owned STI to increase performance in the most straightforward approach within a reasonable budget. 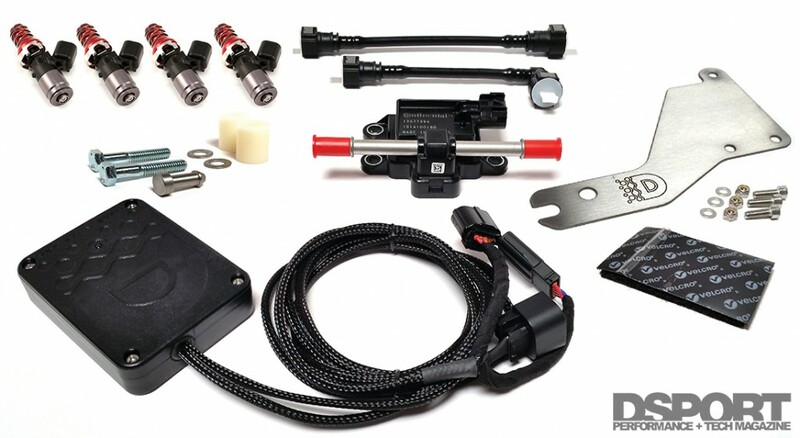 The Delicious Tuning FlexFuel Kit is a true plug-and-play system, no cutting/splicing or modification is needed – just plug it in and bolt it down and you’re ready to go. To maximize the horsepower and torque output of the factory turbocharged EJ25 engine before adding any power-adding parts, we chose to use an alternative fuel on the Subaru. To accomplish this task, we looked to retune the vehicle with E85 fuel instead of the restrictive 91-octane fuel used by most Californians. With a Delicious Tuning FlexFuel Kit, we could run either 91-octane gasoline or E85 fuel or any mixture of the two without having to determine the ethanol-to-gasoline ratio. This plug-and-play system relies on an inline ethanol content analyzer that measures the ethanol content feeding the fuel rails and relays this data through a dedicated signal to the ECU. The ECU then calculates the correct values based on the exact fuel content entering the engine. 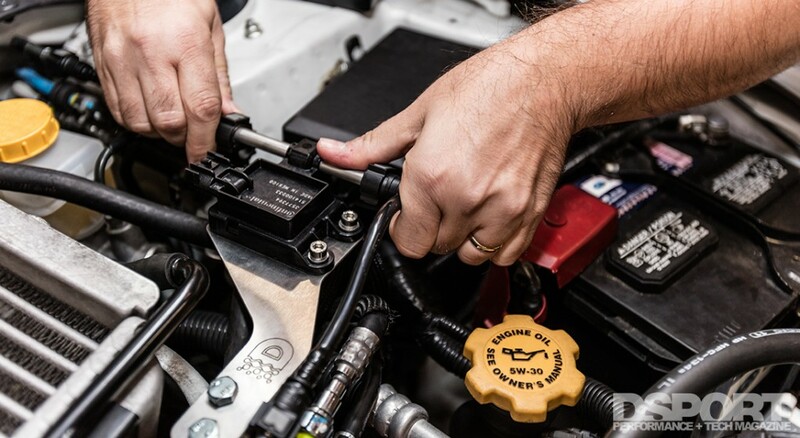 The central piece of the tuning equation needed to gain more performance from the STI was a method to access the ECU and calibrate the proper parameters of fuel scaling, ignition timing, cam angle and boost pressure. With the use of flex fuel, an EcuTek ProECU solution was the clear choice. 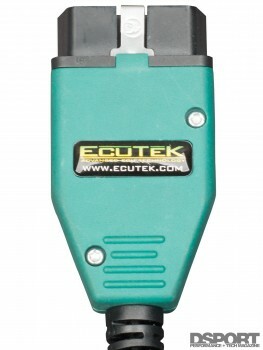 The flex fuel feature on the EcuTek is hardcoded into the tuning software so no custom coding is necessary. This is accomplished by an extra ECU code that was written by EcuTek that is patched into the factory ECU code. The versatility of this section of code is afforded by the RaceROM Feature File, which dynamically adds and removes the custom code as it’s needed. This feature allows tuners to program the best performing tune for each possible fuel used by an input of flex fuel content through a 0-5 volt signal. This integrates seamlessly with the Delicious Tuning FlexFuel Kit, which intercepts vital information through its ethanol content analyzer and factory oxygen sensor. The greater volumetric fuel demand of E85 requires upgrades to the fuel injectors and fuel pump. 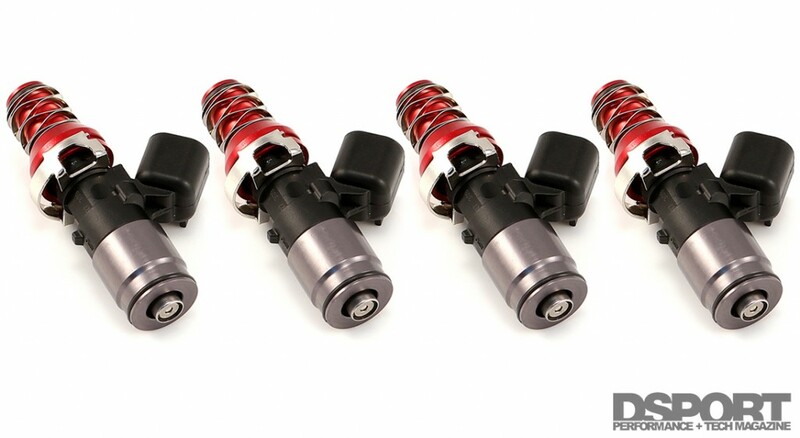 As such, we opted for Injector Dynamic 1,300 cc/min fuel injectors that feature all stainless internals. The construction of these injectors ensures compatibility with all fuels from straight gasoline to any percentage of ethanol. According to Injector Dynamics, ID1300 injectors are ideal for flex-fuel type tunes since the injectors offer great idle and cruise characteristics regardless of fuel type used. Replacing the in-tank fuel pump with an ethanol-compatible offering was necessary but we received a bit of a surprise when removing what we thought to be the factory pump. 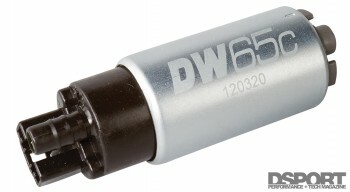 Once we accessed the fuel tank and removed the pump, it was in fact not stock but a DeatschWerks DW65c. Looks like the previous owner had a couple things done to this STI before the current owner took possession. This freebie was a welcome upgrade, however, because it’s exactly what we needed, a 265 liter-per-hour pump that is compatible with both gas and ethanol. The DeatschWerks DW65c in-tank fuel pump is packaged in a compact 65mm body which is perfect when space in the fuel basket is limited. 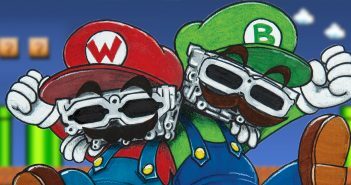 Once Bill Knose of Delicious Tuning developed the map for E85, we looked to install a single part that would likely produce a substantial increase in power. To this end, we chose a TurboXS turbo-back exhaust that eliminates the factory catalytic converters. 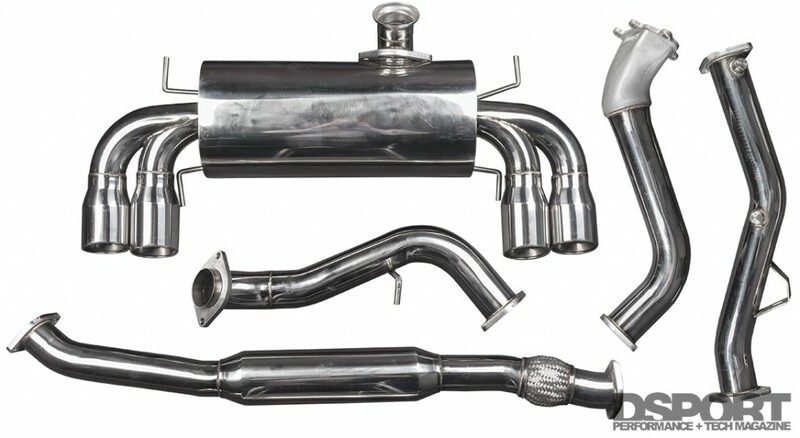 The TurboXS catless downpipe starts at the exhaust side of the turbocharger with a cast 304 stainless-steel bellmouth that tapers into three-inch stainless-steel piping. The downpipe also includes a bung for the factory oxygen sensor along with a spare bung if an additional oxygen sensor is installed. From the downpipe, a TurboXS GT Series stainless-steel exhaust continues to the rear of the STI where four 3.5-inch exhaust tips sit neatly in the factory rear bumper exhaust cutouts. 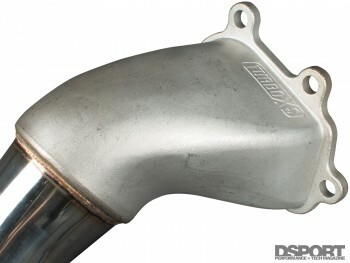 The TurboXS V2 Catless Downpipe was designed with an undivided bell housing. The result is a free-flowing channel for spent exhaust gasses exiting the turbo. The EcuTek tuning software is a powerful tool that allows more than simply accessing the ECU’s fuel and ignition tables. Built into the software are a host of additional features. 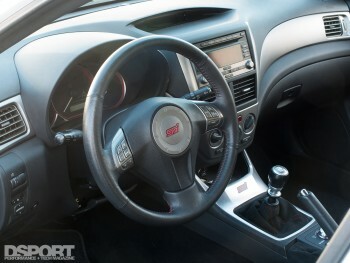 We tapped into the following customization tools on this STI. To minimize time between gearshifts, the EcuTek software allows for flat foot shifting (full throttle shifting). This feature holds the engine speed at the RPM when the clutch pedal is depressed in between shifts. The result is faster shifts that don’t require the driver to remove their foot from the accelerator. Additionally, with flat foot shifting there is no drop in RPMs between gears. One of the biggest performance advantages that the Subaru platform offers over other vehicles is its Symmetrical All-Wheel Drive system. To get the most out of AWD launches, we used the EcuTek to program the built-in launch control function. With the vehicle stationary and in first gear, the driver can depress the accelerator all the way to the floor and the EcuTek will hold engine speed at a user- selected RPM. The launch RPM can be adjusted in realtime with the factory cruise control buttons. While many enthusiasts only drive at two speeds, stop and go, some opt to drive more conservatively at times. The EcuTek software allows for the tuner to customize the factory STI SI Drive selector to deliver a low and high boost map. 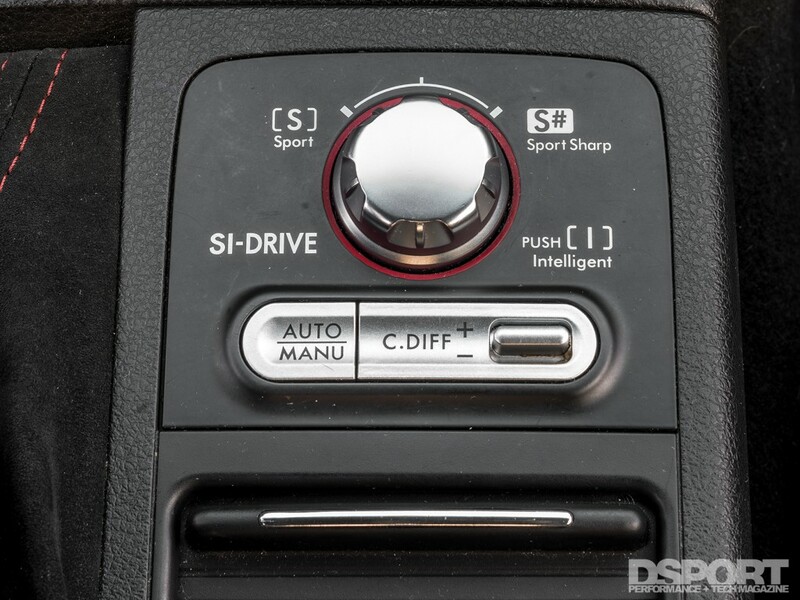 On our test vehicle, Bill Knose programmed the S# (Sport Sharp) option with slightly more boost and an aggressive throttle mapping that gives a little extra response in throttle input. 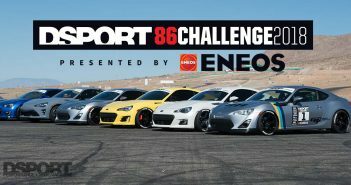 The Subaru’s factory controls were used to access some of the EcuTek software’s additional features including a high boost map which is ideally used when the tank is topped off with E85. 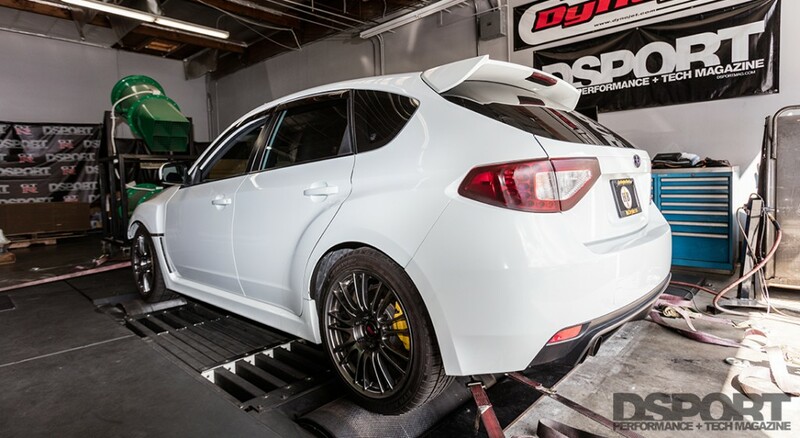 We strapped the STI onto DSPORT’s Dynojet 424xLC2 Linx AWD Dynamometer in factory form with 91-octane gas in the tank. As we connected the RPM pickup and vacuum line from the dyno to the car we noticed that the STI had yet another aftermarket component. This time we found a GrimmSpeed 3-Port Electronic Boost Solenoid. The 3-port boost solenoid allows for high-resolution boost control and provides steady boost levels throughout the RPM range. Again, we were happy to have this upgrade on the car but were concerned that the previous owner may have abused the car. 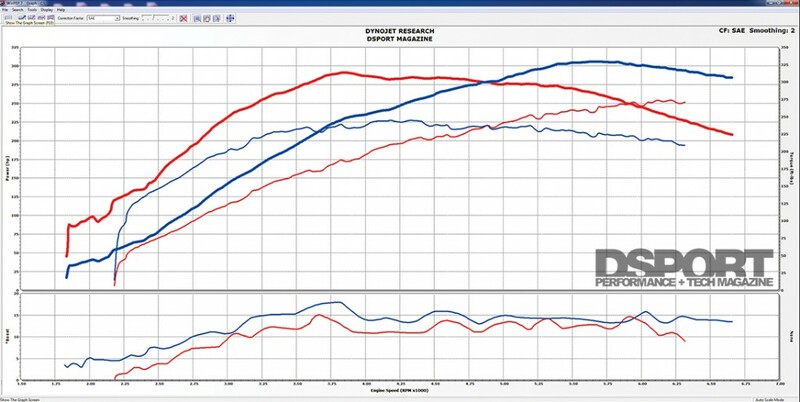 Baseline pulls confirmed that the EJ257 engine was alive and well with a healthy 253.95 whp at 6,230 RPM and 244.47 lb-ft of torque at 4,330 RPM at the factory boost level of 14.98 psi. Once we established the baseline power figures, we pulled the car off the dyno and installed a set of four Injector Dynamics ID1300 fuel injectors. This is also when we pulled out the fuel pump and realized that the car already had a DeatschWerks DW65c ethanol-compatible pump. After completing the fuel system upgrades, the car went back onto the dyno to adjust fuel injector scaling and latency for the 1,300 cc/min injectors. With just a bit of 91-octane gas left in the tank, we added five gallons of E85 that diluted the mixture enough to yield approximately 71-percent ethanol. Since E85 can technically range from 68-to-85-percent, Bill Knose was good to go to start tuning for power with E85. Focusing mainly on ignition timing, Bill was able to add power throughout the RPM range. The cooler engine temperatures and increased suppression of detonation allowed for a slight increase in boost pressure up to 17.92 psi. 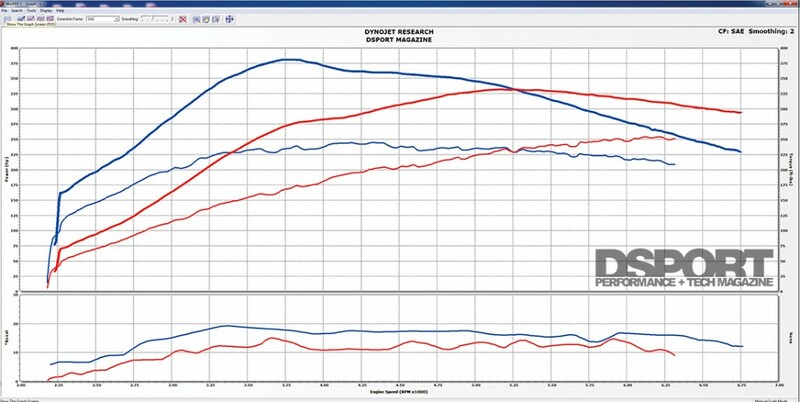 Peak power rose to 305.76 whp, a peak increase of 51.81 whp. An even greater jump in torque was realized, as peak torque output with E85 hit 313.34 lb-ft, a gain of 68.87 lb-ft. The maximum incremental horsepower and torque gains both occurred at 3,880 RPM with an additional 80.11 whp and 80.04 lb-ft, respectively. Additional Notes: The Delicious Tuning FlexFuel Kit came complete with all the necessary installation equipment. From start to finish, the install took about 15 minutes. Installing the injectors on the other hand included over 30 minutes of perfuse cursing and another 30 minutes trying to figure out how to remove the “Bracket of Death”, don’t ask us how it came out because we have no idea. Once it was out of the way, however, the injectors dropped right in and we were able to button up the fuel system quickly. After letting the car cool down, we removed the factory downpipe, midpipe and cat-back exhaust system. With the factory parts out of the way, the massive cast bellmouth of the TurboXS catless V2 downpipe bolted up to the five mounting points of the factory IHI VF48 turbocharger without a hitch. The V2 downpipe was redesigned from the previous model to allow for increased ground clearance for lowered vehicles. Following the downpipe, the TurboXS GT cat-back bolted up with the provided gaskets and hardware. The 304 stainless-steel piping follows the same exhaust path as the factory unit but maintains proper clearances to moving parts and heat shields, an impressive feat for a full three-inch system. Back on the Dynojet, Bill was about to make the proper adjustments to compliment the reduction in back pressure afforded by the new exhaust system. Substantial performance gains were observed on all points of the powerband. Peak horsepower was up to 331.86 whp from the previous run with a maximum incremental gain of 49.9 whp occurring at 3,600 RPM. At the same RPM, the maximum incremental torque output checked in at a hefty 72.82 lb-ft with the peak figure hitting 379.66 lb-ft. 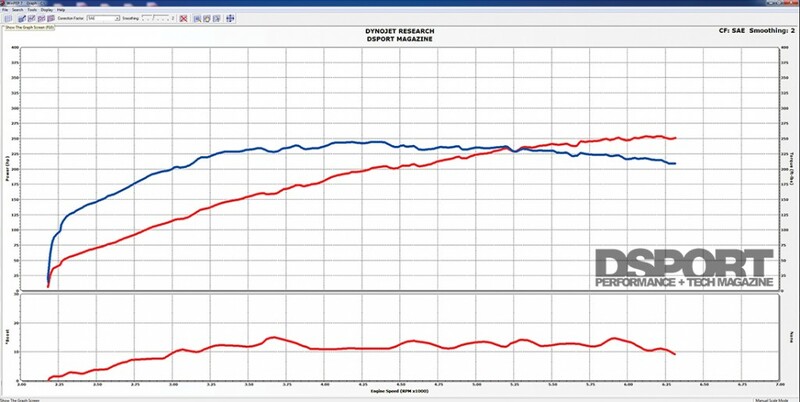 The final maximum boost pressure seen was 19.19 psi, just over 1 psi from the previous dyno runs. 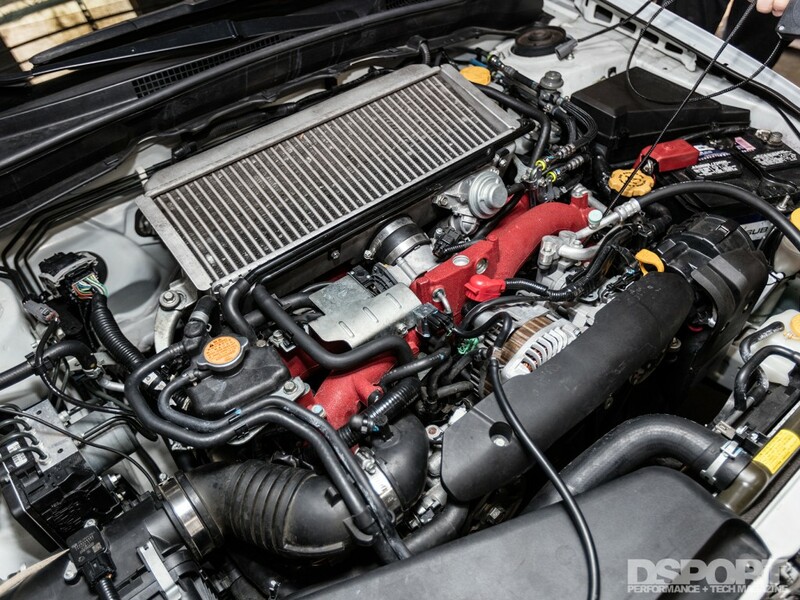 With just one power-adding component, we were able to extract substantial gains from the EJ257 engine. The addition of flex fuel allowed for the versatility in tuning on either 91-octane gas and E85. In return, the race-gas-like characteristics of the ethanol blend fuel opened up the door for more power production through ignition timing, fuel enrichment, boost pressure and camshaft control. 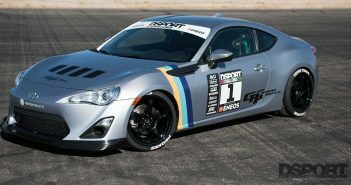 The maximum power numbers broke through the 300-horsepower mark to 331.86 whp, while torque skyrocketed to 379.66 lb-ft. 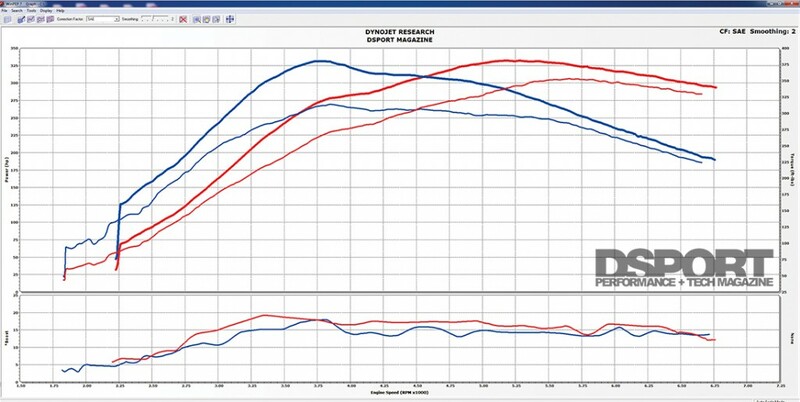 The maximum incremental gains were huge as well with an additional 108.97 whp and 149.74 lb-ft of torque occurring at times throughout the powerband. In analyzing the cost to performance gains, we found that the conversion to flex fuel added up to less than $2,000 and delivered an additional 51.81hp and 68.87 lb-ft of torque to the wheels. Looking forward, this setup pushed the factory VF48 turbocharger near its limit, the next step would be to address this bottleneck with a higher-capacity unit. Stay tuned.